Julia Ford was once famous globally for investigative journalism until the story she was covering went so wrong and an unthinkable act put her on the run. She sought refuge in idyllic Shutter Lake, took a job as lifestyle reporter for the local paper and remained hidden in plan sight for five years...until murder snuffed out Sylvia Cole, the young woman who knew too much.With Sylvia's killer still on the loose, another girl missing and Julia's past showing up in the form of FBI Special Agent Richards, Julia begins a search that uncovers an evil spreading throughout Shutter Lake. Her last encounter with evil ripped her life apart. But this one could destroy some of the town's most prominent citizens and tear down Shutter Lake's very foundation.How far will she go to expose the deadly secrets in a once-perfect town built on lies?The novel, all the lies, is part of a groundbreaking, fast paced 4-book suspense series that will keep you turning pages until the end. Advance reviews describe BREAKDOWN as "unique," "brilliant" and "the best series of the year." 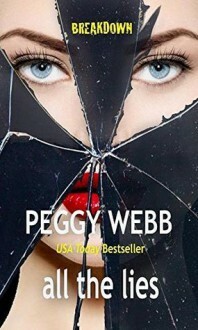 The complete series includes the dead girl by Debra Webb, so many secrets by Vicki Hinze, all the lies by Peggy Webb and what she knew by Regan Black. You'll want all four books of the thrilling BREAKDOWN series!